Click here to learn more about Lamplighter Ministries. 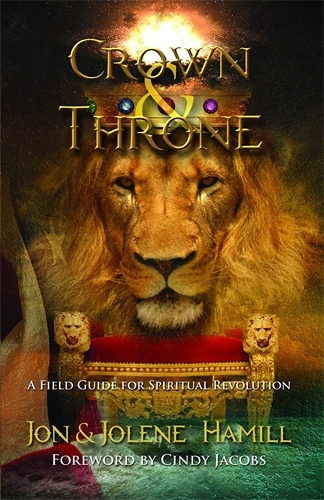 Click here to purchase “Crown & Throne: A Field Guide to Spiritual Revolution” by Jon and Jolene Hamill. This global broadcast was Week 5 of Soaring222: Discipling the Nations. Members of Soaring222 will also receive access to the outline, transcript, PowerPoint, and coaching guide for Jon’s message as well as all the other teachings in this powerful 12-week series. Click here to learn more about Soaring333, our next 12-week series starting in July 2015 and being led by Steve Shultz. Click here to download the MP3 replay. It’s really getting dark out there. It is time for God’s burning lamps to shine – a burning lamp revolution. With this at heart, Jon and Jolene Hamill and the Revolution team are so excited to release “God’s Turnaround Verdict – Daniel 7:22” to the world. Daniel 7:22 – “until the Ancient of Days came, and a judgment was made in favor of the saints of the Most High, and the time came for the saints to possess the kingdom. This live global broadcast out of Washington DC is very significant spiritually. May 7 is the National Day of Prayer. It it also it the anniversary of the start of the 21 day solemn assembly that Mike Bickel called in 1999 that launched the International House of Prayer (IHOP). Jon and Jolene are the founders of Lamplighter Ministries. They have ministered in conferences and churches throughout America, as well as internationally in Canada, Germany, Sierra Leone and Israel. They are the authors of the recently-published book “Crown and Throne: A Field Guide to Spiritual Revolution,” which has gained widespread popularity across the nation. What is The Turnaround Verdict and how does this apply to you, your nation, and our world? Discover what The Turnaround Verdict is and when and how the gavel came down releasing the Daniel 7:22 verdict from the courts of Heaven. Learn how this affects and applies to nations as well as to people. Blessings to let your light burn brightly!